When Daniel OBrien had his first mobile chicken shed made, he didn’t know it would be the beginning of a highly profitable business. In this episode, he shares with James Schramko how online marketing and SuperFastBusiness membership have been key to hundreds of thousands of dollars in sales and an international market for his products. 01:29 – What is Chicken Caravan? James: James Schramko here. Welcome back to SuperFastBusiness.com. Today, I have a very special guest. You may not have heard of my guest, unless you’re in a specific market. I’d love to welcome to this call Daniel OBrien. James: Daniel, you have come from absolutely nowhere in our environment to the forefront of the success thread inside SuperFastBusiness membership. You just posted recently in December 2016 some of the things you’d done over the last year, and you called it Daniel’s SuperFastBusiness year. The reaction was outstanding. You had so many people liking it, and commenting, and asking you questions. And I thought, wouldn’t it be great to get you onto this call? Let’s break down a SuperFastBusiness membership case study with Daniel O’Brien from the incredible website ChickenCaravan.com. Daniel: Yes, let’s do this. James: What does Chicken Caravan actually mean? Daniel: OK. Good question. I do get asked that a bit definitely outside of my normal circles. Chicken Caravan is a mobile, free-range egg shed. So for farmers, they’ve got a paddock full of grass, they might already have some cows or other livestock, they can add a free-range egg farm to their current farm because it’s all movable infrastructure and keep the hens out on beautiful green grass and move them around. The chicken caravan is the actual movable shed, the housing that has the nesting boxes and all the cool technology and features that is the next generation, next level of farming. James: Right. Well that gives us great context. So we’re not in the make-money-online space, we’re not a biz opp, you’re not MLM, you’re not any of the typical marketing-related type businesses. However, the stuff we’ve been doing inside SuperFastBusiness membership has really been applicable to your business, and that’s what I want to talk about on this particular call. So what I want to do to start with is let’s just wind back to the beginning of this year. What did Chicken Caravan look like at the beginning of the year and what sort of challenges were you having with your online business especially? Daniel: OK. Back at the beginning of the year, I’ll probably just think back of what we didn’t have that we do have now. So we didn’t have a podcast, and that was something that I wanted to do. I was doing a few webinars, but that was sort of some here, some there. They weren’t sort of scheduled in. We didn’t have a published book. We had a membership site, but it wasn’t a forum, and the difference with that, like a normal membership site, you go in there, it’s got video training, but it’s a bit of a ghost town, like you think, ‘Am I the only one on the planet that’s paid money to learn this stuff?’ And there’s just no interaction. So that’s now been transferred over to a forum. But our online presence was good. We do a lot of video marketing. Our SEO and our inbound inquiries was steady. But I really wanted to create a lot more of a training platform because essentially, we’re in the manufacturing business. Unless you got like high-level tech, it’s very hard to patent some things in the manufacturing industry. So for us to patent every single component of what we do, it’s hard, so one of the ways we want to succeed in the marketplace is obviously make a good product, but also provide the training and support and everything else that goes with it. So we’re not just selling a chicken shed to a farmer. We’re really selling a package, a business in a box, and we’ve helped train and coach farmers, almost known as an industry where you can’t make money. We’ve been able to sell them a package. They’ve made all their money back in the first year, and then buying multiple of our units. James: Wow. So going back to the business, what did it look like in terms of where you’re at at the beginning of the year, before you started rolling out some of the things that you just mentioned? Daniel: So the business, it was a manufacturing business, and our online presence was a website, a YouTube channel, and we did a few webinars. James: Right. That sort of describes where a lot of people might be at who are listening to this. James: So I want to sort of move forward into what sort of things did you roll out during the year and then we’ll have a look at the change that that caused. Daniel: Yeah. So in March, we rolled out a book. That was something we published just as an ebook up on Amazon. Like, a book in most terms, unless you’re writing about Harry Potter, they’re not a moneymaking machine. Like if someone’s thinking, let’s go write a book to be a millionaire, maybe look at your business plan. It’s a way of getting information across. You can get the information across to the masses for a reasonably cheap price for a buyer, and it creates credibility. So that’s one thing I’d wanted to do for a while as a bit of an entry level to learn about us and who we are and a bit more about our products and our expert opinion about the industry. James: It’s an authority builder. James: So did you find people come to you now, trusting you more? Did it improve conversions? Daniel: It really is a hard thing to measure because now, we do have so many avenues. But definitely, just the fact that we’ve sort of got a book out, and if we’ve got other competitors in the market that don’t have a book, it certainly brings you to the top of the list of like, ‘OK, these guys, they obviously know what they’re doing. Like they’ve got a book out.’ Even if they haven’t read it, a lot of people, they don’t read books, like everyone’s busy, they don’t have time. But I’ve tried to make it as a reference book. So you can just sort of flick to straight to chapter seven or chapter 16 or whatever and read it. It’s not one where you need to do from cover to cover. But definitely, it just gives more credibility. It gives people confidence. They might not be ready to make a big investment with you. They want to build some trust. They want to find out a bit more about you. Our videos are good. They can watch the videos and go, ‘I want to find out a bit more. How about I pay a little bit of money for a book?’ Yeah definitely, if it hasn’t increased conversions now, I think it will over time as people consume that and spend a bit more time thinking about it. James: Fantastic. And then you did a bit of segmentation this year. Daniel: Yes. I’ve sort of known about segmentation. I’m actually implementing it. So I’ve done a lot more of it this year, of looking where people are coming in and sort of asking them like what are your interests, what are you looking at? Because our market, we’ve got some people that may join our email list and they’re never interested in buying a big chicken caravan that could cost like over $20,000 and have extras and such. They might have sort of 20 chickens in their backyard because they’re on sort of a few acres. So I need to be careful not to sort of send them a message to say, “Hey, invest $30,000 and you have a business,” and they could be receiving their email and go, ‘This is great. But I’ve got five acres and I work full time.’ So now, we’re trying to learn like who are you, why did you join my email list, how can I help you? And through segmentation, now we can send out emails, or videos, or communications that really talks to them. It’s something we’ve sort of just started to implement and there’s a lot more to be done sort of over the next year. But basically, right message to the right person. James: Perfect. And we did have a lot of discussion about the ASK method this year. We had a lot of members had taken the course. I certainly went through it. It was a focal point for my business as well. So it was easy to pick up on the conversation if you’re inside SuperFastBusiness. You also forayed quite a lot into Facebook Live. Daniel: Yes. Facebook Live for us was a little bit of an accident. It was funny. It was something I’d wanted to do because we do a reasonable amount on YouTube already. I thought, let’s give this Facebook Live a go. So I already had the video gear and the wireless mics. Because Facebook Live is done sort of with your smartphone, I needed to find a little connection to put my wireless receiver into the smartphone. So I bought something on eBay for like $4 or something. And I thought OK, next time I’m out at the farm, I’m going to do one of these and see what happens. So on this particular day, we’re doing some other filming, I did a first, I think one or two videos at one farm, and then we went to another farm that we use. We work with a number of farms. It happened to film a new product that we’re about to bring out, and it wasn’t actually ready yet. James: So it was a prototype. Daniel: It was a prototype. And I thought, this will be fun. I’ll just tell people, “Hey, this is a prototype. It’s dusty, it’s dirty, but we’re bringing it out, and I’ll just show you a bit of an update.” And I thought, it might get sort of 2,000 views or something because we’ve got a couple of thousand people that like us on Facebook and a little bit of a fanfare for a couple of days and forget about it. Well, the algorithms and sharing and things took over because it is a new product. I now understand why companies, when they bring out a new car or a new phone or something, they don’t tell anybody until it’s actually ready to buy. James: Well, they do leak spy shots and stuff. They put out a few photos with a stick-it-up card to build anticipation. Journalists might accidentally stumble across a prototype phone in the pub. It doesn’t hurt to create a bit of stir. It sounds like it created a bit of a stir. So that’s what we did with Facebook Live. I haven’t really touched it since because we’re still trying to get those orders out for that product, which we are sort of manufacturing and sending out all over the world now. We sold a few all over the world. So yeah, Facebook Live, I’ll definitely be doing more in 2017. But something stumbled across. And sometimes, it is that with marketing, you give something a go, see what works. That definitely worked for us. Tick in the box for that one. James: Nice. And just on a home office scenario, you’re now using a new setup than what you had before, which is another sort of topic we talk about in the community. Tell me about that. Daniel: Yes. So I’ve got a home office, which is separate to the house. So it’s actually an office that’s in the backyard. So it’s not in a bedroom of the house, which was quite important to me, I think. I’ve got two young kids, and I thought it would have been hard for them if I’m like, I’m just going to this bedroom and closing the door, and they’re like, ‘What’s going on?’ But if I physically walk out the front door, dad’s going to work now, there is a separation, and they sort of know that, and it does give me a bit of space without sort of having background noise or what’s happening. But it’s excellent because I am right here at home, I’m not commuting, and I can spend more time with the kids. There are some times that the kids are in the office for a bit when I’m just doing something that doesn’t require a hundred percent of focus and attention. So it’s great just having that family aspect as part of the business. James: And you use a standup desk too. Daniel: I do. I’ll have to admit, I sometimes do sit on a tall drafting chair. James: It’s good to alternate apparently. So good points there. Now, you’ve attended a few local meetups. I’ve seen you at some of the Sydney meetups, and that’s where SuperFastBusiness members catch up with each other in major regional areas and certainly in a few different countries as well. How have they helped? James: And you could bring your Osmo camera. It’s become a star of the meetup. You get impromptu performances from other members, which is always fun, especially if they’re a professional comedian. Just on that, you did mention a number there. I think this year, you had a record month in sales, which is exciting. Daniel: Yes. We had a record month, did over $450,000 in a single month. The good thing about that is it wasn’t like a big product launch. It wasn’t a lot of striving. It was just doing all the things you do in business – your marketing, your follow up, and we sort of hit that amount. That’s one thing to be sort of excited about. Too often, and I know you talk about everyone’s they’re after the launch, they’re after the big, sort of hustle in that. But when you just get back to just do what you do well and you do it month in month out and you be consistent, your business will grow. Business, like it’s a formula. And that’s one thing that, yeah, it’s just quite exciting for us, because I can look back when I started. Before I even was building chicken caravans, I was a free-range egg farmer. So I know what it’s like to be out in the paddock at nine o’clock at night sort of catching chickens because they got out. Like the hard yards of business, and then just sort of looking at it now as it’s grown. We’ve got an international presence, and we’re helping farmers all over the world and adding massive value to them. To be able to grow to that figure, it’s a bit of an award. It’s a bit of the customers voting with sales, buying your product, saying, “I believe in what you do, and thank you.” I think that’s really what it is. James: When you were catching runaway chickens, would you, in your wildest dreams thought you would generate almost half a million dollars in a single month? Daniel: Definitely not when I was being a chicken catcher. My dollars per hour was probably pretty low. James: Now you mentioned something vitally important there. You’ve expanded into other markets. We’re an international community. SuperFastBusiness members are from all around the world, especially Australia and New Zealand, North America, so that includes Canada, and we have Asia and the UK. So we’re one of the most international communities as possible. You’ve started expanding into the USA. Daniel: Yeah. So we’re expanding into the USA. Next year, the first quarter of next year, we will have an office in US, in Texas. We’ve currently already done sales to like Canada, and New Zealand, and USA already. But to actually have a presence on the ground there, it’ll just take the business there to the next level, because you’ve got the trust factor where they can call an American number and talk to an American person to buy the product. Where at the moment, that’s all happening, like if anyone there wants to buy our product, it’s all sort of happening through our Australian office. That’s quite exciting. And really, like a lot of that’s happened just through the internet. When we look back over the last five years, we haven’t spent much dollars on actual advertising like on Pay-Per-Click or Facebook ads. It’s been quite low. But we’ve done millions of dollars, and a lot of that has just been by having a good website, answering questions, and my main thing is video. The video, in any business, it just creates the trust factor of people get to know you. They feel like they can trust you. That’s one thing that has really expanded our business and our products globally because people can see us. I look at so many companies, and they’re big companies, and they’ve got no video, and I’m thinking, why aren’t they using this very, very powerful medium? James: Yeah. I mean, that’s why you’re here on this podcast, to talk about what sort of impact it can have for a free-range egg farmer who decides to make caravans for chickens. It’s big. James: Now, you launched a new product with a couple of emails. Daniel: Yes. We launched a small chicken caravan. It costs about $3,100. So it holds 30 chickens. So that’s more for the backyard market rather than commercial egg farmers that are sort of crunching all the numbers and looking for a profitable enterprise. We got some promotion of that through Facebook. But ultimately, that was two emails sent out and some Facebook ads. That sold, I think, in the first 72 hours, that was over $30,000 worth of sales. So it wasn’t like a pushy promotion like a lot of the internet marketing 101 would say, do three emails, then do a follow-up, and then do this. I think for some markets, that’s good. But for us, I like a more relaxed approach. And every part of the marketing or even products we bring out, I like to ask myself, is this valuable to the customer? It’s easy to create another product and bring it out and almost like milk your customers to get more and more cash out of them, but is it going to be valuable? I look at it, to send them six or seven emails to remind them to buy this product, I think, I don’t want to receive six or seven. Like send me a couple, and if I want it, I’m going to click on it. I’m going to read more. So yeah, that was two emails, and over $30,000 worth of sales. James: That’s amazing and really, really good result there. You’ve actually got a couple of speaking gigs. Daniel: Yes. So I got a speaking gig earlier this year. It was actually with the New South Wales Business Chamber. They heard about what I was sort of doing, I think mainly with video. That’s what they got me in to speak about. I really enjoyed sharing with other business people the power of the internet, and what I said at that speaking gig, like if I could just get one tool, because I couldn’t talk about sort of every single aspect of what we’re doing in internet marketing, I said, “If I could just choose one, it would be video.” So I went through so many points of how video can help their business. I did a recording of that, and I posted it inside the forum, so any of the members of SuperFastBusiness, you can go back and look for that. James: Oh, that’s legendary. Thank you. James: We do accept contributions from members, which is one of the things that makes it so special, is that we’re a combination of best practice. One of the other topics that comes up an enormous amount is team and scaling. You had a couple of points around that. One thing is you hired a GM and the other thing is you took your team on a trip. How much did that impact the business? Daniel: Obviously it cost a bit – so impacts. But as for the fun factor, we took our team snowboarding and skiing for four days down at Jindabyne. It was just great. It was just a time when we can get away from the business and throw snowballs at each other and laugh at each other as we sort of crash into a powdery snow down the hill and just hang out for four days. I think, it’s so important when you work hard, have that outlet where you can play. And obviously, a ski trip is like a pretty big deal. But we do other things, like for our Christmas party, we had sort of the kids in that, and partners and kids, and we went and played mini golf. And then we had dinner afterwards. Other times, we went to skirmish. I don’t think I’ll do that again because when I used to do skirmish when I was like 19 and 20, it was fun. But now, it just hurts. So just think about that one before you take your team to skirmish. James: Yeah. Well that’s something great until you get shot. So just finally, you really tuned up your own community. This is almost hilarious, but you can build a community of chicken farmers I suppose, chicken business owners. You’ve launched a forum with over 100 members. How is that going? Daniel: Yes. It’s going great. I loved transitioning from just a membership training site to a forum. If anyone is thinking of, ‘I’ll just put all my training just on a website, and people can just access that,’ that’s good, but it doesn’t provide sort of any communication and real ownership of community. It’s like being on Facebook and you’re the only person on Facebook. It just doesn’t work. So transitioning it to a forum, it’s just so good because as you said, the power of SuperFastBusiness is the people in it. Because someone can ask a question and you can answer it, James. But other people give input to say, “These are my results.” And that’s what we’ve done for free-range egg farmers around the world. I’m not sure how many countries are on that, but we’ve got people from all over the world, and we’re sharing ideas and collaborating. Someone else, they’ve already tested and measured something, they can share the results. Because our industry, it’s really growing from the traditional free-range eggs where it’s just in a big shed and they’re running out on dirt to pastured free-range eggs where they’re actually in a movable shed, they’re on green grass. Because the industry is really growing and developing, the thought leaders have a platform to sort of share ideas. So I think having a forum, and you can put training in there and such, it’s been amazing. It really has been. James: And then you added a podcast just because it was time to crank things up a notch. How is that working out? Daniel: Yeah good. I’d like to do more of them, but podcasting, it’s great. You can just be on a microphone, on Skype, interview someone, or if you’ve got a training in mind, you can just present it, and it can just go out to the world. I think podcasting obviously you know, it’s a great platform, and it’s relatively easy. Like I do a lot with video. I shot a video yesterday, and come back, and I’m just pulling out the good points, and editing it up. There’s a bit of work to it because you’re not just dealing with audio, but you’re dealing with the visual aspect of it. But with podcast, you can sort of sit around in your board shorts or whatever. You don’t need to worry about what’s in the background. You just speak it into a microphone. And audio is so easy to consume as well. You can be in the car or wherever. So we’ve got amazing feedback especially from farmers because they’re out in the paddock and they can just listen to a podcast. So they’re loving it. I need to do more in 2017. James: Yeah, I did videos every single day for years, and then I stopped for a while. I started doing some again. But you can definitely get an editor as well. That really helps the process. But the podcast, I’ve been doing, gosh, we’ve had over two and a half million downloads of this podcast now, which is just a consistent effort. It’s so easy to listen to a podcast driving a tractor, or walking the dog, or in the gym. It’s an accessible medium and easy to produce. So I love that. You’ve been so generous sharing these ideas. I’d love to just sort of get a summary of like what’s the business look like now at the end of 2016 as we’re documenting this journey? I have a feeling that you’re in for enormous growth again next year. What is it looking like and how does that make you feel? So we’ve really been setting up a platform for that. So the business now looks like we’ve got a general manager in, we have a membership site that can scale. So we added another three or four hundred people to that. It’s a platform that can handle it. We’re setting up all our support and systems in the business just like the standard operating procedures. We’ve got the podcast, which that’s growing and can go all over the world. I think already, it’s sort have been downloaded in 50 countries. We’ve got the book out. Our YouTube channels are continually growing, and people can find out more about us through video. We’ve got a website that ranks really well because we’re just being consistent just with doing basic things with SEO. So when someone types in “pastured egg farming” or “how to start a free-range egg farm”, we’re going to be up there somewhere on the front page of Google. I just see it really as a platform now when we obviously the Australian market is still growing and we’re doing stuff in New Zealand and we send some some products to Canada. But just with the amount of inquiries we get for America, we’re now in a place where we can go there. We’re not just going there with a product, we’re really going there with a service. I think that’s one thing for a lot of businesses. If you are selling a physical product, can that be a service? Because if a product is just one transaction, it’s sort of a case of we’ll take it or leave it, let’s shop around on price now. But for us, when they can consume, they can read the book, it’s got a website attached to the book, where they can get more online resources, they can listen to the podcast, they can access the members’ area and learn more, suddenly, they can have a lot more confidence in us and our product because of the service that we offer, and we’re adding value to our customers. James: That is fantastic. The real story here is that you’ve combined a lot of elements that are in our various section. You’ve segmented, you’ve used Facebook live, you’ve published a book, you’re running webinars now on a more consistent basis. You indicated in the beginning you weren’t as consistent., but you’ve automated those now. You’ve got your home office set up, you’re healthy, you attend the local meetups, you’re building your team, you’re going into new markets, you have launched products from just emails using lots of video, you’ve got speaking gigs, and you’ve got this community that’s making your product hard to shop. So you’ve got from manufacture through to the education sewn up, and a podcast. This is basically a transition from chasing errant chooks around to solving problems for other people, and as you said, they’re voting for you with their wallet. It really is a story of free-range chicken farmer who breaks the internet. It’s been so great to watch. I just want to thank you for being a member of SuperFastBusiness, because you’ve been helping other members, you’ve inspired them, and you’re showing what’s possible with the information that is right there and accessible. Daniel: Yeah. It really has been great being part of your community. There’s awesome people in there that know so much. So I know, especially when I was setting up the forum, I could just ask a question, and yourself and so many other people have already done it, so they’re like, “Just do this.” I’m like, ‘Oh great, that just saved me two days of research.’ I think that’s like massive value for someone. If you’re not already a member, just to get answers to something rather than going through Google for sort of two or three days, that’s the power of a forum of high-caliber people that are actually doing it. So thank you. James: That’s so cool. Alright, so we’re going to put up on the post, we’ll put an example of a YouTube video that you’ve used. And we’ll put a link to your book. What’s it called on Amazon? 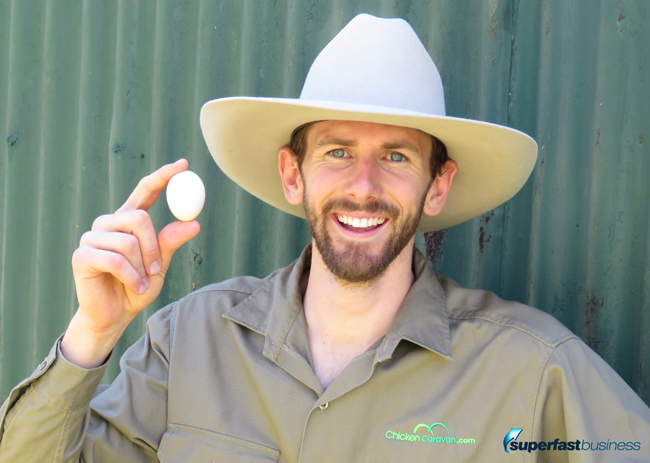 Daniel: It’s called Pastured Egg Farming Success. James: There you go. So this stuff works in any market. If you’d like to be a member of SuperFastBusiness, then please go to SuperFastBusiness.com, join the waiting list, and we’ll send you an invitation to join. I want to thank our special guest, Daniel OBrien, who is from ChickenCaravan.com. Also, next year, he’s going to be teaching people how to use video from TurboZebra.com. It’s been great having you Daniel. Have a great rest of the day.